Craft beer thoughts and reviews from a guy who loves craft beer! Well, Raleigh Beer Week has come to an end. I am sitting here typing up this blog entry on a Saturday morning next to a 1 Liter water bottle ready to spend the weekend relaxing at home after one heck of a fun week. While Raleigh Beer Week didn’t officially kick off until Monday night, On Saturday, Flying Saucer offered up a great vertical flight of Stone Old Guardian Barley Wine from 2007-2010, all on-tap and the deal even included a complementary Old Guardian glass. The flight offered a firsthand look at how a good Barley Wine matured over time. The 2010 version was still very sweet with very noticeable alcohol content while the 2007 was smooth, well balanced, and absolutely delicious. Monday night’s festivities kicked off at The Borough with Mayor Charles Meeker tapping a cask of Aviator Black Horizon Belgian IPA with roasted Thai peppers added to the cask. They were also selling bottles of Founders Kentucky Breakfast Stout, which was a very worthy beer to kick things off with. From there I headed a block down the street to Flying Saucer, who had just tapped a keg of New Belgium Lips of Faith Dark Heather Saison, which they were selling for $3 during Monday pint night. Saisons are my favorite style of beer to drink in the summer, and was intrigued when I was handed this beer because it was as dark as a stout. It was still a smooth, refreshing beer, as it should be. After a quick stop in at Woody’s for some grub, I headed to Landmark Tavern where All About Beer’s Julie Johnson was on hand for a cask of Bell’s Two Hearted Ale. Another very smooth, hoppy and flavorful cask beer. Tuesday night offered the most interesting event of the week. Foundation was offering Beer Cocktails at 9. First I stopped by Flying Saucer because they were tapping a keg of Foothills Pappy Van Winkle aged Total Eclipse Stout, a beer I truly enjoyed and ended up ordering another each day through Friday. When I got to Foundation it was no surprise that an event like that in a bar so small had the place PACKED. The one I ordered was called Bourbon Stout in 3..2..1 which featured Foothills Sexual Chocolate, Old Weller Bourbon and Brown Sugar. While it wasn’t the same as a Bourbon barrel aged stout, it was still very tasty. The other one I got to try a taste of was called Strange Brew, this one was made with Aviator Black Horizon, Kraken Spiced Rum, a whole egg and maple bitters. I was a little apprehensive about that one, but it actually reminded me of a White Russian. Wednesday night Flying Saucer hosted a Beer Dinner featuring Brooklyn Brewery featuring their co-founder Steve Hindy. While I did not attend the dinner, I was at the bar watching the managers and bar staff pouring goodies such as Local 1, Local 2 and Sorachi Ace. 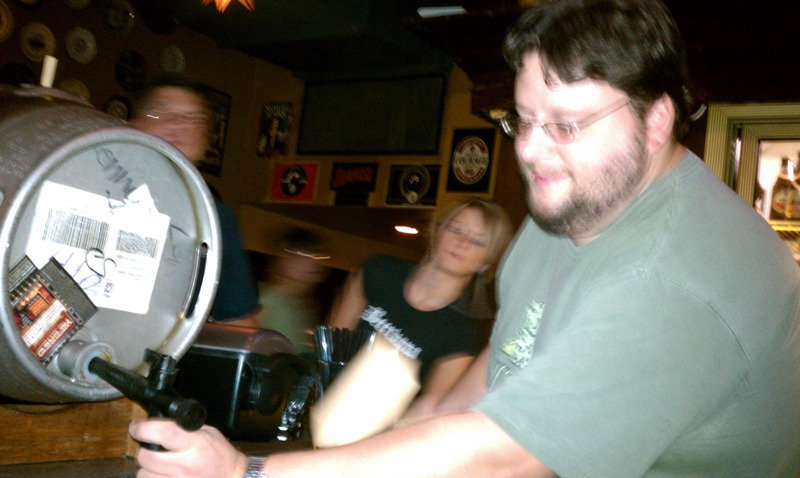 At 9, up the street at The Borough, they tapped a very small cask of French Broad 13 Rebels ESB. I have long been a fan of French Broad’s beer, and I must say, out of all 7 casks that were tapped this week, this one was the one that most exemplified how casks in Britain are always described. Smooth, full bodied, well balanced flavor and aroma with low carbonation and a nice murky haze to the beer. Thursday featured a Brewers Forum at Busy Bee upstairs in The Hive. Spike Buckowski, co-founder of Terrapin Brewing, Sean Wilson, founder and CEO of Fullsteam Brewery, Mark Doble, owner of Aviator Brewing, Steve Hindy, co-founder of Brooklyn Brewery and Sumit Vohra, CEO of Lonerider Brewing. The forum offered an interesting perspective of the industry and what brewers and brewery operators go through in the course of their jobs. Afterwards, I headed to Flying Saucer where I they were tapping a cask of Ballast Point Black Marlin Porter with cocoa nibs. This one turned out to be a very smooth, flavorful chocolate brew, I must say, Ballast Point makes some incredible beer. Friday, after taking time to eat dinner at home for once and also avoiding I-40 traffic, I got to Landmark to find that after an hour, they were still pouring their cask of He’Brew Jewbelation 11. I did take a sample from the cask and enjoyed it, but I was there for Allagash Fluxus 2010, a very smooth chocolate Imperial Stout. I then headed to Busy Bee and had water for about a half hour while I waited for their cask of Lagunitas Hop Stoopid. I have been enjoying Hop Stoopid quite a bit this summer because it is a very enjoyable and fairly inexpensive Double IPA. The cask had been sent to Lagunitas and was only two weeks old. That definitely showed in the beer as it had loads of citrus hop aroma and flavor without any dry-hopping in the cask. After that I headed to Flying Saucer to wrap up the week. They were tapping two very special beers at 9 to end the week. They had a cask of He’Brew Bittersweet Lenny RIPA. I’ll admit, I have wanted to swing the hammer to tap a cask for long time, I asked Zach, the manager, if he would let me tap the cask, and to my surprise, he said I could! I’ve seen plenty of casks tapped that resulted in a large spray of beer, usually all over the person tapping it and the people around him, so I knew the risks! Luckily, all it took was one swing and the tap was in. They also began serving a very rare keg of Founders Canadian Breakfast Stout. I had been wanting to try this Imperial Stout aged in maple syrup barrels ever since I first heard about it and it truly lived up to my expectations. Overall, I have to say, the week was a blast! I had a lot of great beer and met some great people. I really look forward to this being an annual event, and hopefully with enough advance planning, it can be an even bigger event next year! There are actually 7 days in a week, you know, not just 5, I’m just saying.